This world could use our help, dont'cha think? I do, so I make it a point to do what I can to change the world for the better. Here's a glimpse at what I've done just this month to try and make a positive difference in my community. Tiny But Mighty is a non-profit that raises money to help homeless animals in Nashville, Tn. Instead of focusing on heart-wrenching sadness the annual fundraiser uses light-hearted humor to solicit donations for the Nashville Humane Association. Area pets are "arrested" for various crimes, pose for mugshots and hope to "make bail" (the minimum contribution of $250 in their name). I'm sure you recognize these two by now. Jack & Penny Lane are both counting on you to bail them out of jail! Jack was caught in flagrante delicto, snatching our dinner from the table as his accomplice provided a spectacular diversion. Penny Lane was turned in by an agitated mole, traumatized at being dug up out of the ground, carried to the perp's bed, covered with a blanket and cuddled under duress. Seriously, these two are both rescues with health issues that would have killed them without the loving intervention of humans. They were saved, and I want you to help many more animals have great lives and loving homes. Bail them out of jail - because you're really bailing out their fellow furry friends who just need a chance in this world. Click here to donate by December 1st, 2016. Earlier this month I took part in another fun fund-raising event. I was asked to judge the costume contest at the 6th annual Viva La Diva run benefiting Fifty Forward along with my friends Melissa Watkins and Eric Adler. FiftyForward enriches the lives of adults 50+ by providing pathways to health, well-being and lifelong learning. The non-profit organization serves adults over 50 by providing adult day services, meals on wheels, travel packages, a senior center for the arts and a care team offering care assessment and services to older adults. Despite the early hour and the cold it was a lot of fun. It never hurts to have a vintage red Valentino coat - tailored to perfection by Eric - and a purple boa to match my hair courtesy of Fifty Forward. A photo shoot to show support for all of our Nashville families and communities who are feeling anxious or afraid in the face of uncertainty. Safety pins used to be a punk symbol. Now it signifies a safe, supportive ally you can turn to if you find yourself in a hostile environment. Safe is the new punk. I have no problem continuing to be a rebel. The good we can do in this world does make a difference. I'm thankful I get to be a part of it all. What are you waiting for? 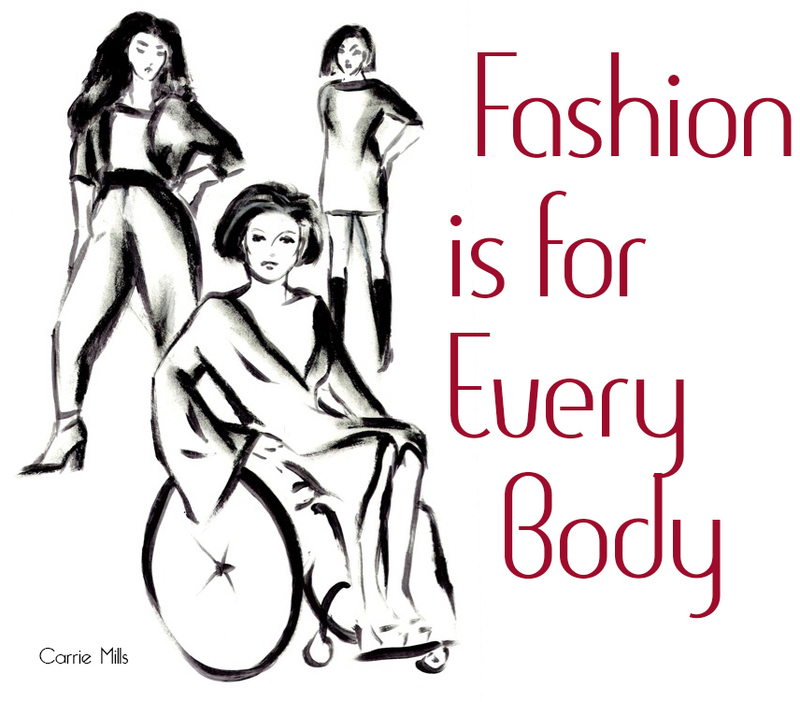 FInally, be sure to catch my latest piece on Disability Horizons: Disability and Fashion: How to Sparkle This Christmas. Linking up with Visible Monday, Creative Mondays, I Will Wear What I Like, Monday Mingle.